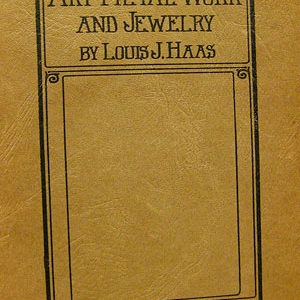 This 1902 book is the third edition. It is 98 jam packed pages of great chasing and repousse information. 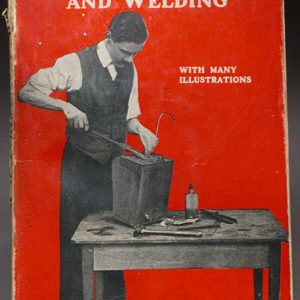 The author taught many people (including royalty) to do repousse and chasing as a hobby pastime, a recreation. It is clear that at the turn of the century the upper and middle classes pursued hobbies such as painting, drawing and repoussee work (today people watch TV). An arristocrat writes:”This is work that lasts; each blow from your hammer helps produce something that cannot be broken, get dirty, or soiled, as is the case with so many other sorts of work; nothing but fire can destroy the handiwork of the Metal Worker”, and Gawthorpe writes “What is more delightful and interesting than to be able with one’s own hands to make useful and ornamental articles which are almost indestructible, wherewith to decorate one’s own sanctum as well as the more public rooms of the house ? There are 42 excellent illustrations showing all kinds of chased work and excellent drawings of tools. The book begins with a history of Western repousse work, from biblical times through Cellini. Asian work is touched on. A call is made for the student to study technical details, punch work details and not to be misled by design. Gawthorp criticizes the quality of many of his contemporary teachers. 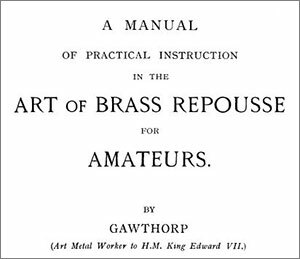 This book is intended to teach the amateur and contribute to a revival of repoussee work. Drawing skill is important, but copying is suggested for beginners. Tools are described and a minimal set of punches is proposed to start with. The pictures are good and allow the reader to copy the tools. In 1902 you could buy the set, and there are some commercial sets available today which are similar, though more expensive than the nine pence each they were at the time the book was written. Even then though some oval and forming tools had to be hand made and were not available from suppliers. Pitch recipes are addressed and the author mentions that you can buy his own special recipe pitch from him directly and that it is only a little more expensive than making it oneself. 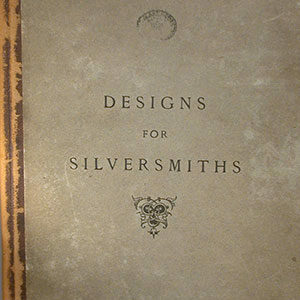 The author also sold pattern books of designs for students to use. He prefers pouring the molten pitch onto a wooden or stone block with a retaining rim of paper or cardboard with the pitch an inch or so thick. This is then placed on a canvas sandbag which reduces noise when chasing. He also uses an iron half ball with the pitch again about an inch thick above the rim. One of his wealthier students had a small table made with a rotating top surface just for chasing on. The (window) light is on the far side of the work when chasing, you sit facing it. The metal is scoured with emery and oil to give a matt surface that lets you see scribe lines better. The design is placed on the metal using carbon paper and then scribing them, or by attaching the drawing to the metal and pricking through with a needle-like punch to create dots. The descriptions of how to hold and use the lining tools are in depth and clear. Hammering is well described, as is the importance of thinking and planning. Background matting and texturing is described. Attaching and removing work from the pitch and repoussee work from behind are addressed in detail. Hammerwork on lead is advised for larger areas. There is great intimate detail about how to chase what to watch for in the tools and marks made. Lots of description of chased surface options. There is an entire chapter on creating and tooling backgrounds. It is very extensive and detailed in its descriptions and approaches. 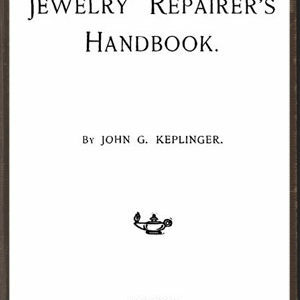 There is a chapter on related techniques, how to saw, cut, soft solder the metals as well as lacquering. Further chasing notes follow, including how to push metal out from the inside of a vessel to get relief during the chasing, and using snarling irons. A final chapter deals deeply with design for chasing, considerations, details and options. File Size: 16.2MB, 98 pages.